Are you hosting a wedding in the Big Easy or do you want to add some Louisiana Mardi Gras flavor to your wedding guest goody bags? Here are a few ideas for putting together welcome bags with local flavor that are sure to please all of your guests. Festive masquerade masks create a fun atmosphere from the start of your celebration. Try different kinds of masks for your guests. Below are paper mache, feather and venetian-style masks. Mardi Gras beads come in a huge variety of styles and designs.These specialty beads featuring Fleur de Lis, hurricane cocktails and Louisiana are just a few! Choose one of these Mardi Gras motifs for your wedding and use it for your favors and goody bags. Louisiana souvenir packets like this one provide a little taste of Cajun culture along with local folk legends. This Cajun Survival Kit includes a sampling of Spanish moss, red beans, crawfish, Tabasco and much more. Let guests take home a bit of Mardi Gras with these fun and reusable plastic cups. Traditional Mardi Gras colors of purple, green & gold and Mardi Gras themes like masks, fleur de lis and crowns are available. Individual soaps like these in Mardi Gras motifs of the fleur de lis or Louisiana crawfish make great wedding favors. These are great guest bath soaps, sure to bring back fond memories. Everyone loves having something to munch on in the hotel room (other than the mini-bar). So add in some local food favorites that they can enjoy now or later. Aunt Sally's famous pralines, Cajun spices or hot sauce and the requisite Hurricane cocktail mix all add a local flavor to Louisiana welcome bags. Bags, baskets, pirogues and more. 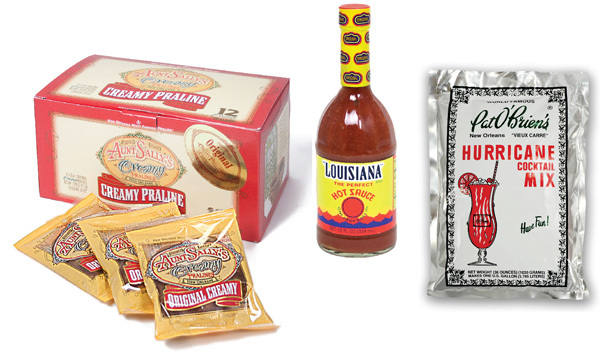 There are lots of options to hold all these fun Louisiana goodies for your guest care packages. Here are some suggestions. This kraft paper bag with an image of the state and favorite crustacean crawfish screen-printed on it can be found here. This handled bag makes carrying home all these goodies easy. A small replica of a wooden pirogue adds a great Cajun flair. This version is filled with Cajun foods and beads. Find it here. This natural sinamay basket shaped like the state of Louisiana is a great size for wedding goodies. The basket can be reused later as a serving tray. To purchase this Louisiana basket, click here. Creating this elegant Louisiana basket is easy! Add a layer of natural wood shred like the excelsior shown here. Then fill the basket with a venetian mask, Louisiana beads, fleur de lis cups, pralines, gumbo mix, fleur de lis soap, note cards and souvenir cookie cutter. For a bag in the traditional Mardi Gras colors, check out these small metallic gift bags , the jester favor bag and clear cello favor bags in purple, green or yellow. These bags are smaller and need less to fill them. Explore this blog for other Mardi Gras Wedding ideas and visit us at MardiGrasOutlet.com to purchase the items shown here and many more!